Crossover Diamond Wedding Set with Pave Setting | Shane Co. This spectacular wedding set makes a bold statement with 77 round pavé-set diamonds at approximately .78 carat total weight, set in a quality 14 karat white gold split shank setting. 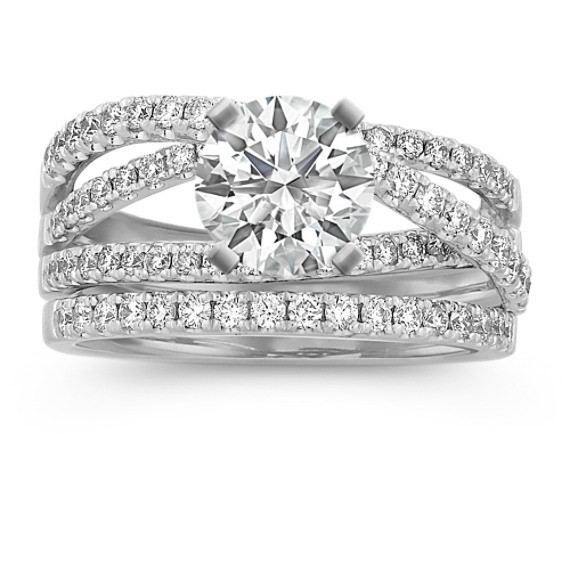 This incredible diamond ring awaits a dazzling center diamond of your choice. Gemstone Carat Weight :.78 ct. t.w. Unique, beautiful and timeless wedding set! I always had an image in mind when I thought of my engagement ring and after just one visit to Shane Co. they were able to bring the beaut out! I fell in love instantly! We paired it with an emerald cut diamond and I wouldn’t have it any other way! I get complaints ALLL the time and I’ve honestly never seen anything like it! My fiancé helped me pick out this engagement ring, we paired it with a gorgeous round diamond. I get compliments ALL THE TIME. The ring is gorgeous, it's comfortable and Shane provided the best customer service. I am so lucky to have this ring the rest of my life. This setting is gorgeous! I had a 2.4 carat center stone put in it. ????? ?